Massey Ferguson staged their New Year Pace Race on New Year’s Eve this year (much better) at the War Memorial Park. 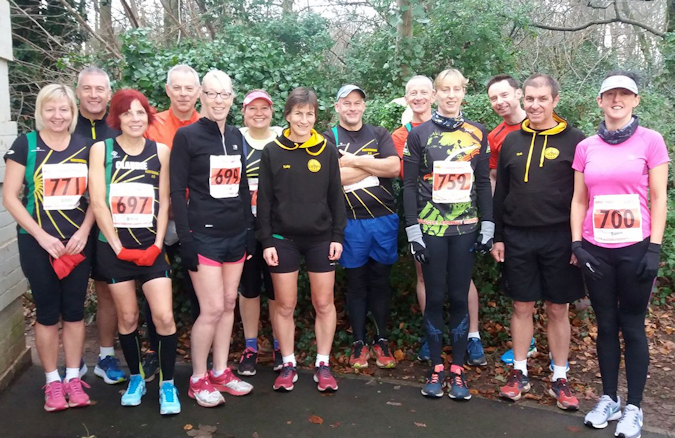 A race with a difference, runners had to predict their time to complete the 3.55 mile course with no time or pace aids and try to finish in that time or as close to it as possible. The winner was not the first over the line but the runner who got closest to their predicted time. This was a 7 mile event sold as 7miles,7 hills. There was an added bonus of a river crossing and water tunnels to cross that were thigh deep. With the temperature at -4°C they were kind enough to have broken the ice for us. This was tough, no place to get any rhythm going and the hills were not runable by me on both the up and the down. Sticky mud that sucked your trainers and caused you to fall with the rutted ice at the top meant it was hard work. But hopefully I’ll be back. and sunset. Breaking it down into 10 lap chunks helped pass the time. Having had races cancelled over the last few weeks I resorted to a train journey to the big smoke. It paid off with a PB on what was a more undulating course than I had imagined it would be but not so much that it had big effects on pace. 6.2 laps around a pristine tarmac 1 mile cycling course with a fair bit of weaving in and out of runners. But I wanted a PB and I got one. That’s me done until 2018. Merry Christmas to all at the club!